Yesterday, I wrote about the advantages of choosing to or not to cook fairies. Today, let’s be a bit less selfish. Let’s think about what the fairy would prefer. Plenty of people, including my wonderful girlfriend, aren’t willing to play a game if it contradicts with their moral compass. I’m this way to a certain degree: I’ll never be able to play Grand Theft Auto for this reason, and if I ever have a choice, I’ll almost always choose the “good” choice in a video game. So, is cooking fairies morally sound? What happens when you cook a fairy is slightly ambiguous. A lot of people assume that you’re cooking the actual fairy, because you hold the fairy and then select the prompt that says “cook.” If this were the case, a lot of people, including myself, would take issue with it. Killing a cute fox to make a meal might not feel great, but it’s no different from ordering a burger from McDonald’s, except that instead of giving you more hearts in Zelda, the McDonald’s burger will probably make your one heart weaker. If you’re not a vegetarian “irl,” there’s not much reason to be one in-game. Fairies, however, are humanoid creatures that have proven to be great friends to Link alongside his journey in games such as Ocarina of Time and Majora’s Mask. Some might argue that those fairy companions were annoying and it makes you want to eat them more, but I wouldn’t personally be pushed to such an extreme. However, the animation shows the fairy flying in an upward spiral with sparkles emanating from it and then disappearing, not being thrown around in the pot like most other food. This suggests that you’re cooking the fairy’s magic dust, not the fairy itself. Granted, this might solve one issue of morality and open up a whole new issue of grossness. As previously mentioned, we know that fairies are humanoid from The Wind Waker, and that they only look like balls of light in some games because they’re so bright. Thus, “fairy dust” can get kinda gross. We see Link drink a whole vat of it in its animation. But just what is it? Is like sweat (already gross) or is it (as I discovered in this wonderfully entertaining wikipedia article) “draining the RPG?” Perhaps it doesn’t matter; the stuff is still sprinkled over Link when he dies, but at least he doesn’t have to drink it. At the end of the day, however, it hardly matters. Link still has to capture them against their will, judging by how hard they can be to catch. You might say that it’s for the greater good of Hyrule. 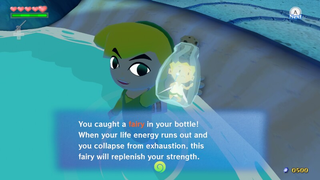 But, when they’re bottled in The Wind Waker, it’s still hard not to feel a little bad while looking at their sad faces.